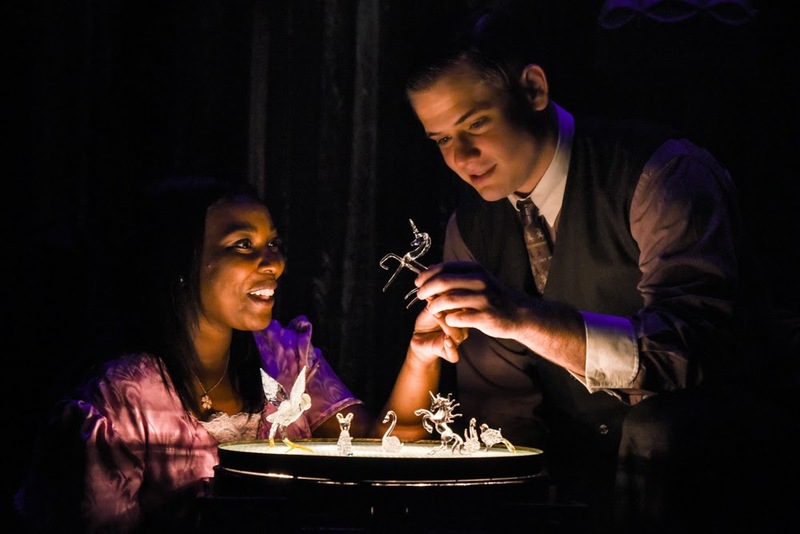 To kick off Masterworks Theater Company's inaugural season, the company picked a classic from master scribe Tennessee Williams, The Glass Menagerie. Putting their twist on the drama, Masterworks plays with casting. A multicultural take on the Williams classic is filled with its own risks. Would it resonate? Does it fit the world of the play? Does it weaken the story? Fortunately for Masterworks, and the script, the ethnically diverse casting worked wonders for this new lens into The Glass Menagerie. While the story should need no introduction, to refresh, the play follows Tom Wingfield through his memory as he takes the audience on a journey into his family’s St. Louis dwelling during a pinnacle moment in their history. Amanda, the matriarch, is a former Southern Belle who makes it her mission to find her daughter Laura a gentleman caller who will whisk her away into normalcy. As a whole, the quartet was quite wonderful. Richard Prioleau brings a stunning fresh nuance to Williams language. As the narrator of the memory play, Prioleau's booming vocal is flavorful and rich, wonderfully enunciating and articulating as the narrator. Though his scenes were not as strong, Prioleau’s presence is the backbone of the production. Olivia Washington as delicate Laura is subtle. She starts off meek and a bit staggering but as soon as Jim arrives and the electricity disappears, she finds her stride. As Jim, Doug Harris was absolutely charming. You couldn’t help but fall in love with Harris’ Jim. Harris and Washington brought new life to their scene of doomed romance, serving as the strongest moment in the entire production. The scene is already beautiful and touching, but the chemistry between the pair was exquisite. Saundra Santiago as Amanda, despite struggling for lines, seemed to take a Greek tragedy approach to the role. Everything is heightened beyond belief. Her presentational tactic was not in line with the other three. In Williams’ terms, she may have channeled a little too much Blanche DuBois. Director Christopher Scott had the challenge of innovation. What could make his approach to The Glass Menagerie stand out? Scott seemed to take great care and consideration in diving into the relationships between the characters. And it certainly shined in the scene between Jim and Laura. From a staging standpoint, Scott made some choices that did not land. It was a very distracting decision to mime the eating with every other prop existing in this world. While it may have been a budgetary thing, fake eating rarely works. The fire escape conceit did not read well. While space on stage was sacred, the strip of light and inconsistent exit caused more problems then not. That being said, the aura of the era is stunningly displayed on stage through simplicity. The scenic design by Campbell Baird was beautifully executed. Thankfully the architecture of the space worked to its advantage. The brick walls looked almost intentional. The lighting by Joyce Liao was simple. While the blackout scenes could have used a little more light at the start since practically speaking there was bound to be light seeping through the window, what Liao did bring to the Jim/Laura scene was striking. Dustin Cross clothed the actors fittingly. They worked in the period and worked for the characters. However, Tom’s opening costume was near identical to the recent revival which has now become iconic through image. Brett Macias, who served as sound designer and composer of original music had quite a presence in the production. Since Williams calls for the occasional incidental music, its placement needed to be specific. Sadly, the underscoring felt sporadic and unintentional. Dramaturgically, instrument choice played a big factor into the world of the play. The occasional electronic music in the transitions was unfortunate. It felt far too modern for the period. The Glass Menagerie is an American classic. While it may be overdone, a solid production can reignite the beauty of the text. Though it’s not perfect, it has some incredible moments. For a first production, Masterworks has done a pretty solid job.